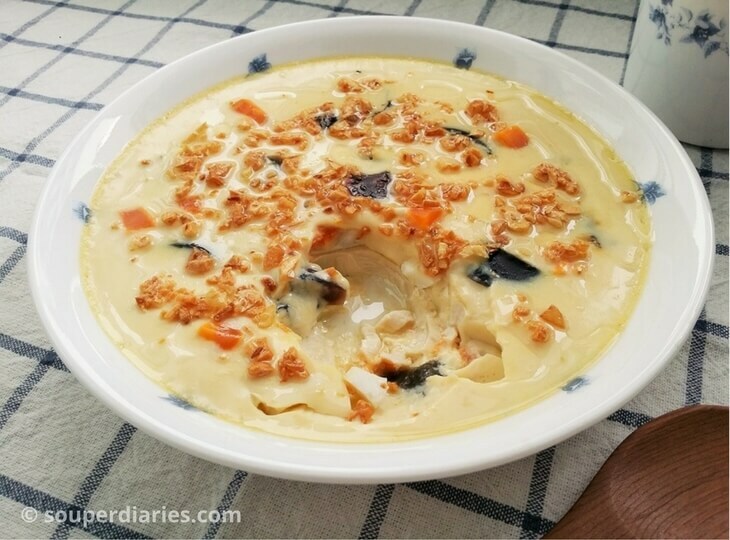 Steamed Three Color Eggs – a home-style Chinese dish made with 3 different types of eggs: hen’s egg, century egg and salted egg. Shown below are the century egg and salted duck egg. 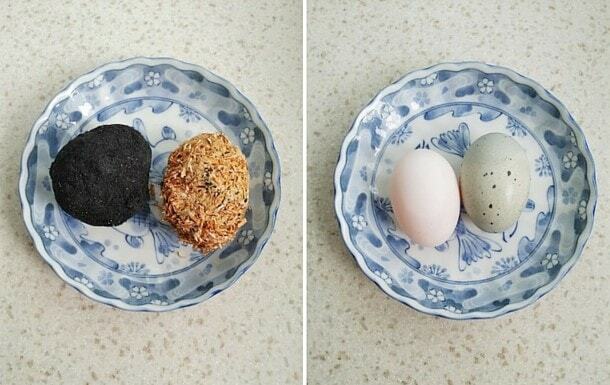 The egg covered with salted charcoal paste on the left is the salted egg. They are usually made from ducks’ eggs soaked in brine or packed in damp, salted charcoal. The white part of the salted egg is much saltier compared to its yolk. These yolks are often used in mooncakes, a traditional Mid-Autumn Festival pastry product where they are left whole to represent the moon. Wash away the outer layer before you cook it. Because salted eggs are so flavorful and salty, they are commonly used as a condiment for congee or to flavor a variety of dishes. Besides the usual and popular dishes like salted egg prawns and salted egg crabs, creative cooks came up with salted egg chips, salted egg pizza, salted egg yolk donuts, salted egg yolk cakes, salted egg yolk tofu, salted egg yolk custard buns, salted egg yolk muffins, salted egg yolk macarons, salted egg yolk ice-cream (! ), salted egg yolk fries and the list goes on and on! 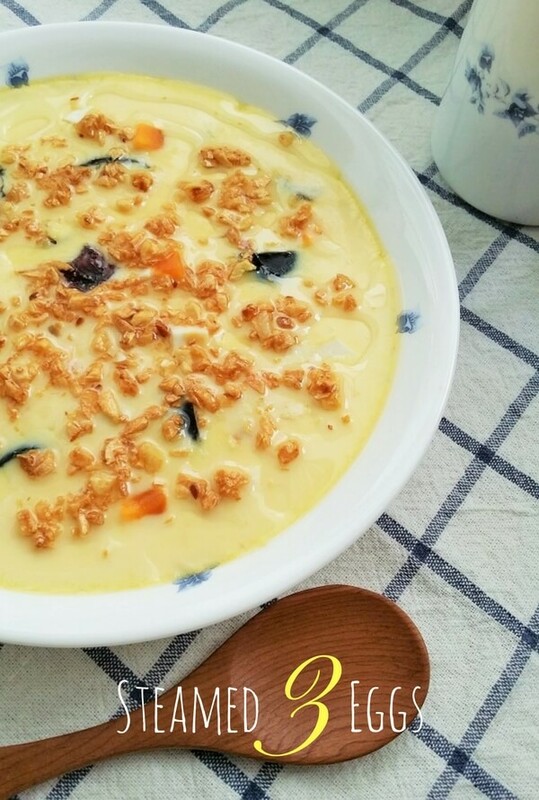 Read this article to find out other unique foods created with the humble salted egg. Currently, the latest food craze in Singapore is… salted egg yolk croissants! It seems like everything just tastes better with salted egg. Even croissants. Eateries everywhere are coming out with their version of salted egg croissants which originated from a bakery in Hong Kong. The hunt is on for the best salted egg croissant in Singapore! 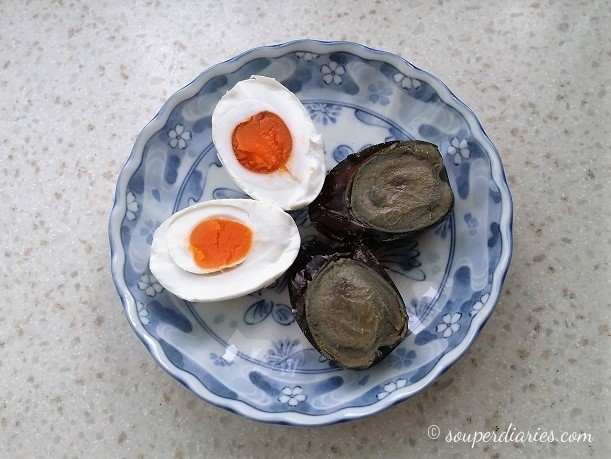 According to Wiki, century eggs (pidan) has a production history of 600 years where the first discovery was said to have occurred in Hunan during the Ming Dynasty. They are made by preserving duck, chicken or quail eggs in a mixture of clay, ash, salt, quicklime, and rice hulls for several weeks to several months, depending on the processing method. The preservation method transforms the yolk to a dark green to gray color due to the presence of hydrogen sulfide and ammonia. This process turns the yolks to a creamy and mushy consistency while the white part becomes dark and translucent. The whole egg resembles a jelly-like orb to me. Unlike the salted eggs, I would say that perhaps century eggs is an acquired taste. My Piggy does not like century eggs much. So sometimes, I’ll just use the white (or is it black now?) part of the egg, leaving the yolk out. For this steamed three eggs recipe, I sliced some soft tofu to about 0.75 cm slices and placed it on a heatproof plate. The tofu helps to prop up the diced eggs. Otherwise, they would all sink to the bottom of the eggs mixture. If you don’t mind that, you can omit the tofu. To make the diced eggs more visible, I cut them into biggish pieces. You don’t have to use the whole salted egg and century egg if they are too much. Arrange the egg pieces on top of the tofu before pouring in the egg mixture. I used my Happycall Diamond Non-Stick Wok Pan to steam the eggs. She’s been with me for over 4 years now and I still constantly cook with her. I use this wok pan for my stir-fries, steamed foods, fried foods, etc. You can also use any type of wok to steam. Be sure to check the water level during the steaming process to ensure that it is not drying out. The steaming time really depends on the amount of liquid used. So, for example, you wish to use 1 or 2 chicken eggs instead of 3, you’ll have to lessen the chicken stock/water and also adjust the steaming time as it will cook faster now. This simple and homely recipe goes really well with rice or porridge. The key is to control the steaming time according to the amount of liquid used and water/stock proportion. You want to achieve a soft and smooth texture. 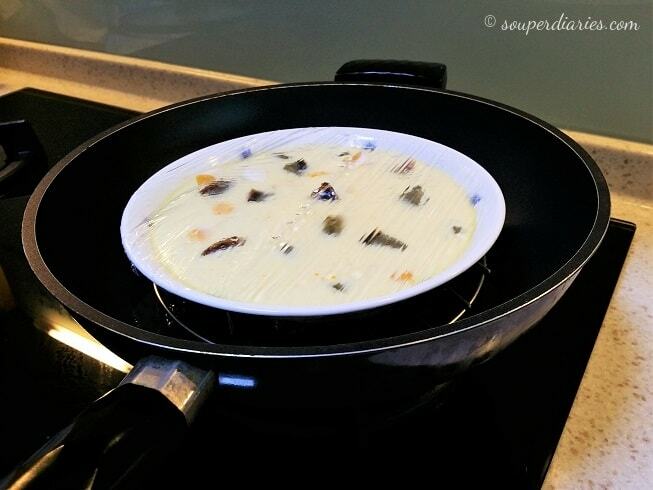 If you enjoy eating steamed eggs, read this post on how to create smooth and silky eggs! Don’t want to miss a recipe? Sign up for Souper Diaries newsletter delivered to your inbox! Connect with me on Instagram, Pinterest, Twitter and Google+ for the latest updates. See you again and happy cooking! This delicious and savory steamed 3 eggs recipe uses chicken eggs, century egg and salted duck egg and tofu. Crack the eggs into a bowl and whisk. Pour the eggs through a fine meshed sieve. Add chicken stock to the eggs and stir to combine. Arrange the silken tofu slices on a heatproof plate. 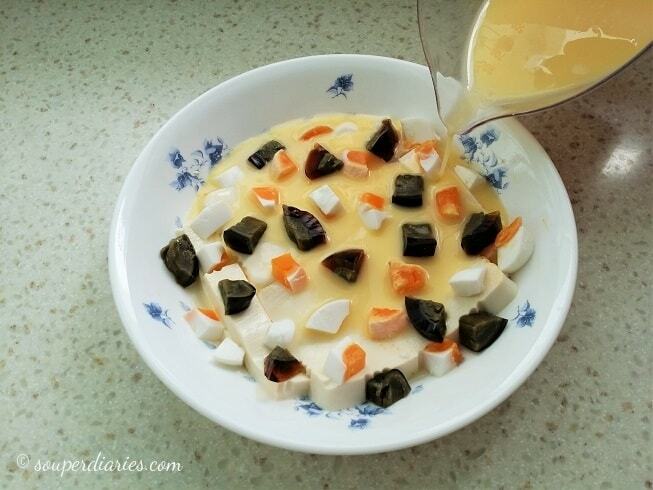 Scatter the diced century eggs and salted eggs on top of the tofu and distribute them evenly. Pour the egg mixture into the plate. Cover the plate with a cling wrap to prevent unsightly pork marks on the steamed eggs. Fill a wok with enough water to steam (about ⅓ full) and put in a steaming rack. Bring the water to a boil. When it boils, carefully place the plate on top of the steaming rack. Cover the lid and steam on medium heat for about 10 - 12 minutes. (I used 12 minutes). Once the eggs have set, gently remove from heat and garnish with freshly fried garlic pieces, garlic oil and spring onions. Serve immediately. 1. Keep a close watch on the eggs so that they are not overcooked or undercooked. 2. To check whether the eggs are ready, I gently moved the wok pan. If the eggs look runny, give it another 1-2 minute of steaming. Done well, it should be slightly firm yet a little jiggly. 3. The tofu slices serve to prop up the diced century egg and salted duck egg. If you want the eggs to be more visible, slice the tofu into slightly thicker pieces. I genuinely enjoyed reading this article. I’m not familiar with traditional Chinese dishes. Your images are beautiful, and your content reads like a professional writer took the time to construct the blog. Your instructions seem so easy to follow, maybe I will try to make this dish. (I’m not much of a cook, but I enjoy eggs and trying new things.) Cheers! Aww, thanks for the kind comments, Gabrielle. I’m glad you enjoyed reading the article. If you do try this dish, I’d love to know how it turns out for you. Do note that you can adjust the number of chicken eggs if you find that the serving size is too much. If you have any questions, I’m here to help. Thanks for visiting! Wow! I’ve been to Hong Kong and Singapore. My wife is Asian. I’ve bookmarked this article so we can get the party started. Thanks for sharing authentic dishes with us! That looks soooo yummy, but then a lot of your recipes look great! I love to try new food and I love eggs, so I think I will have to try this. Where can I find the salted duck egg? I’m not sure where I can purchase that. Thanks! Thanks for your kind comments, Leahrae. Salted duck eggs and century eggs are usually available at Asian grocery shops or the Chinese section of a supermarket. Hope that helps. Really interesting recipe! I didn’t know you could get salted eggs, nor had I ever heard of century eggs. So I’ve learnt something new today. You’ve made the recipe look nice and easy too.